Use Tableau's built in mapping capability to visualize parks, services, accidents, pollution and more. Achieve the functionality of online Flash visualization without the development cost. How are crime rates changing in Victoria Australia? Whether you are law enforcement, a resident, or a potential resident, understandings changes in crime rates in a particular neighborhood is important. 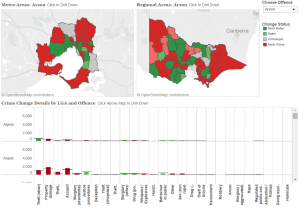 This dashboard shows how occurrence rates of 27 different crimes have changed from 2011 to 2012 in neighborhoods across Victoria, Australia. The color-coded change rates of change range from “Much Better” or “Unchanged,” to “Worse” and “Much Worse.” The top left map shows a detailed view of the Melbourne metro area locations while the right-hand map focuses on the less population-dense regional areas outside of city limits. Use the drop-down filter at right to select a particular crime. Or set the filter to “all” to see overall crime rate change by location. Click a neighborhood segment to see the actual percent of change. Interested in a particular neighborhood? The bottom bar chart shows the year-to-year crime occurrence change for each crime by neighborhood. Hover over the horizontal line on any particular bar for the exact number of instances of that crime that were committed in 2011. Tell stories with public data, no programming needed Data is a critical component of many national conversations, but telling stories with data is not easy. Viewers quickly lose interest in data-intensive stories when not told well, or struggle to find information that is relevant to them. And telling stories well is hard: Flash and other online visualization tools require weeks of programming and are expensive. Tableau lets you create interesting interactive visualizations that help people understand public data. Create beautiful applications that let people find their own stories: their own school or district, or their issue of interest. This visualization shows the U.S. federal deficit projection between 2011 and 2022. 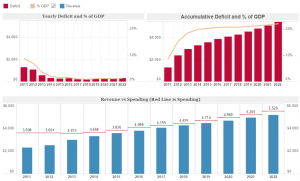 The first dashboard shows an overview of projected deficit growth and projected revenue and spending; the second dashboard provides detailed breakdowns of the projected revenue sources and spending categories. Using the filter panel on the second tab lets you customize your results by spending category. Present large and complex datasets effectively It is not uncommon to see government databases over a billion rows. That volume of data would take a casual Excel user days to wade through, much less understand or share. In many cases it would be altogether impossible. Tableau takes the tedium out of government data by providing an easy-to-use drag and drop interface that anyone can master. And Tableau's Data Engine, a local data store optimized for analytics, lets you work with tens or hundreds of millions of records at interactive speed. This visualization was made from a million-row national health database in less than an hour. It allows users to get a detailed view of the nationwide obesity epidemic and the factors that influence it. You can drill down to your own state. Select Washington using the drop down filter on the top right and notice that some counties in the southwest corner of the state are tinged deeply red. Click on the darkest of those dots (Pacific County). The scatter plots below the map will show you that this high obesity rate may be related to an extremely high smoking rate and a low level of physical activity county wide. All of this interactivity works to simplify the massive database to a view that anyone can understand. Provide valuable insight in minutes Open Government projects are meant to empower advocacy groups and citizens. Unfortunately, most government datasets are so dense and difficult to work with that even a talented data worker is more overloaded than empowered. It’s like having a ream of paper, but no pen. With Tableau, non-profits, journalists and government workers can connect to interesting datasets and start finding stories and solving problems in minutes. Developed by Tableau Zen Master Craig Bloodworth, this visualization analyzes UK crime stats from 2010 to 2011. Use the filter windows at the top to view stats of particular offences or to view by particular measures. Click on a neighborhood in the map lets you filter the % change bar chart to that neighborhood. Distribute information to a small group or to millions Until now, interactive visualizations have been the domain of nationwide media properties with the budget, time and resources for Flash. Sanjay Bhatt at the Seattle Times does not have any of those things, but with some Department Of Transportation data and Tableau he made this interactive visualization about biking accidents. The larger dots represent intersections with more biking accidents. Viewers can zoom into their own neighborhood using the tools below the visualization, or select points of interest for comparison. The ability to easily and cheaply scale from local to global issues is one of the things that distinguishes Tableau from other solutions. As you can imagine, this mapping tool could be used to display any number of relevant city datasets, from parks and services, to crime and traffic. Create transparency with easy-to-use tools State and local governments collect lots of data, and they’re searching for new ways to create visibility into that data for residents and businesses. 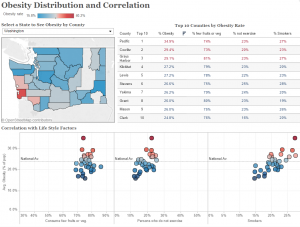 With Tableau, it’s easy for governments to create beautiful and intuitive ways to explore that data, empowering the everyday user to make informed decisions from state and local government data, employment data, census data, demographic data and more. Without investing hundreds of expensive analyst and developer man-hours, governments can create transparency in their data, creating app-style tools that encourage exploration of data and answer specific questions. 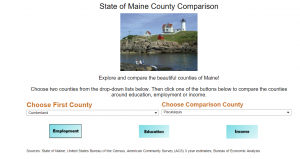 With this app-style visualization, you can choose two counties in Maine, and compare them across trends in education, income and employment. The colorful charts and graphs created are based on U.S. Census data and data from the Bureau of Economic Analysis.